John Snow was born on January 31, 1933 to Tom and Cora Snow on the Morley Reserve. He was given the Ĩyãħé Nakoda name of Ĩtébijadn Mãnĩ ("Walking Seal") by his Great-Grandfather, Jonas Goodstoney, who had been a Chief of Jacob's Band. As a youth, Ĩtébijadn Mãnĩ learned hunting and trapping skills from his father and was also taught customs and traditions of the Ĩyãħé Nakoda. When he was 25, Ĩtébijadn Mãnĩ became a Christian, after which he attended the Cook Christian Training School and Phoenix College in Phoenix, Arizona. Ĩtébijadn Mãnĩ was the first person among the Ĩyãħé Nakoda to earn a post-secondary diploma. In preparation of becoming a Minister, he then attended St. Stephen's Theological College in Edmonton, Alberta. Ĩtébijadn Mãnĩ was ordained in 1963 and served as a Minister for the United Church in Canada and also the Presbyterian Church in the United States. During this time, the federal Department of Indian Affairs (DIA) was encouraging Bands across Canada to assume a greater role in handling their own affairs. For the Ĩyãħé Nakoda, self-government had been a way of life long before contact with the Europeans. However, after almost a century of oppression and confinement on the Reserve, the government had almost succeeded in extinguishing the pride, identity and independent spirit of the Ĩyãħé Nakoda. Self-government by the Ĩyãħé Nakoda in the 1960s required incorporating their ancestral customs and strengths into modern society. Ĩtébijadn Mãnĩ was encouraged to run for the position of Chief of the Wesley Band in the 1968 election. His father had been Chief in the 1950s, so he had certain knowledge of the challenges and responsibilities of this important role. Additionally, with his education and experience in the world beyond the Morley Reserve, skills Ĩtébijadn Mãnĩ had acquired could be of benefit in the forward movement toward self-government. Ĩtébijadn Mãnĩ realized that, as a Chief, the government would have to listen to his advocacy for the people to a greater degree than as a Minister. 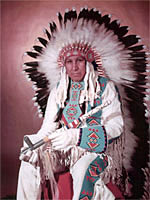 In 1968, at age 35, Ĩtébijadn Mãnĩ was elected as Chief of the Wesley Band. Ĩtébijadn Mãnĩ was elected to twelve consecutive two-year terms as Chief of the Wesley Band. Defeated in 1992, Ĩtébijadn Mãnĩ was re-elected in 1996 and again in 1998. Ĩtébijadn Mãnĩ served a total of twenty-eight years as Chief, which is the longest period that any elected Chief of the Ĩyãħé Nakoda has held this important position. Ĩtébijadn Mãnĩ was a member of the Indian Chiefs of Alberta that, in 1970, presented a strong response to the federal government's 1969 "White Paper". The government had proposed dissolution of Indian Status, Treaties, and the Indian Act. This response, titled "Citizens Plus" but known as the "Red Paper", was largely instrumental in the government's decision not to proceed with an action that was seen to be detrimental for Aboriginals in Canada. The controversy awakened Aboriginals to rise up and speak out beyond the limits of their Reserves. Ĩtébijadn Mãnĩ became widely respected as a politician and statesman. He was known for his oratory prowess at the local, provincial, federal and international levels. Although not without opposition to his political and personal views, Ĩtébijadn Mãnĩ rarely waivered from that which he believed to be in the best interest of the Ĩyãħé Nakoda. At times, he was confronted with controversy and even contempt, but always stood firm, and always with a vision toward the future for his people. In 1977 Ĩtébijadn Mãnĩ published a book, titled "These Mountains are our Sacred Places, The Story of the Stoney People, Chief John Snow". It was reprinted for release in 2005. In 1981, Ĩtébijadn Mãnĩ received an honorary Doctorate of Laws degree from the University of Calgary. In 1986, he was bestowed an honorary Doctorate degree from Cook College and Theological School in Arizona. Ĩtébijadn Mãnĩ passed away on the Morley Reserve on June 15, 2006 at age 73.